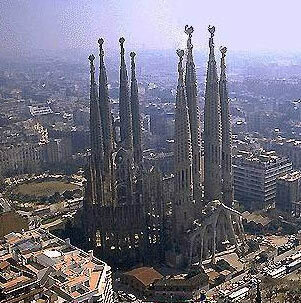 The Holy Family is undoubtedly the most representative work of Catalan architect Antoni Gaudí. It is also the most visited monument receives, not only in Barcelona but in Catalonia and one of the most visited country. Its construction is a symbol of universal brotherhood and justice and still unfinished, this spectacular building for minutes mesmerizes all who visit. The Sagrada Familia is a church that Gaudi thought with 18 towers, 12 of those towers symbolizing the apostles, 4 of them to the other two evangelists and Mary and Jesus. The towers have different heights that are a function of the hierarchy occupied by the characters they represent. Of these 18 towers, today, the Holy Family only has 8 towers located at the front and have no access between them, so the visit and climb the tower must be performed in an elevator. The temple also features inside a room audiovual that offers visitors an informative video about the history of the Holy Family, two stores, a service of luggage and a wheelchair service. If you visit Barcelona, ​​a visit to the Holy Family (at least to see and enjoy the stunning exterior of time unfinished) is almost mandatory.